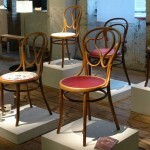 This year is the 150th anniversary of the model No.14 bentwood chair, also known as the ‘cafe´ or ‘consumer chair’. Designed in 1859 by Michael Thonet (1796-1871) and still in production today the No.14 is thought to be the best-selling chair of all time. Thonet is the Godfather of the modern chair, a pioneer of the ‘ﬂat-pack’ principle and one of the ﬁrst great ﬁgures of industrial design. His patented steam forming process for creating bentwood furniture on an industrial scale was revolutionary – as was his reduction of each piece of furniture to the minimum number of standardised and interchangeable components, and the use of screw connections to assemble them. With the launch of the No.14 Thonet presented the basic principles of mass-production which together with his austere sculptural forms set the agenda for subsequent 20th century design and manufacture. With its instantly recognizable double arch back the No. 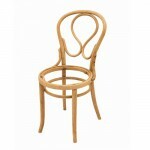 14 is the most well-known of Thonet’s chairs. Cheap, lightweight, robust and full of charm this was a radical design that rapidly filled the cafes, bars, restaurants and concert halls of European cities. 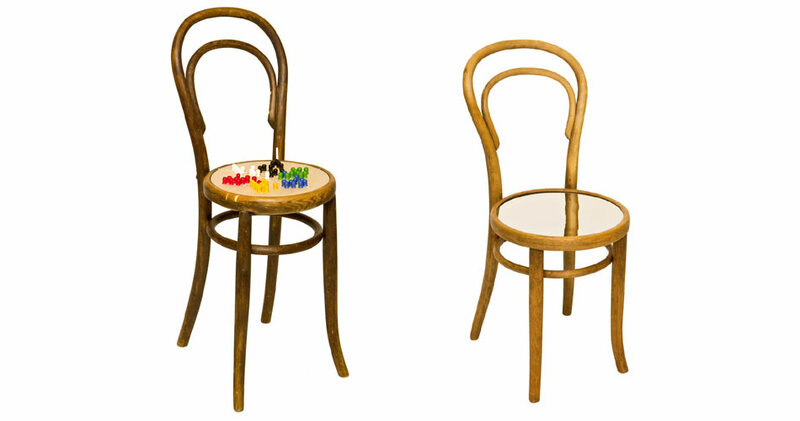 Since Thonet relinquished his patents in 1869 the No.14 has also been widely copied by many of his competitors (such as J & J Kohn of Vienna, of which some of the chairs exhibited here are examples). By 1930 the Thonet company alone had sold 50 million of them. Today they are still popular in public and domestic spaces here in Paris and throughout the world. 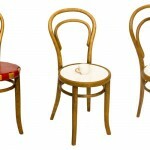 The beech frames of bentwood chairs are very durable, and their screw connections allow them to be simply tightened up when necessary, the seats however – either caned or made from formed plywood – are the weakest element and may require several replacements during the chair’s long lives. 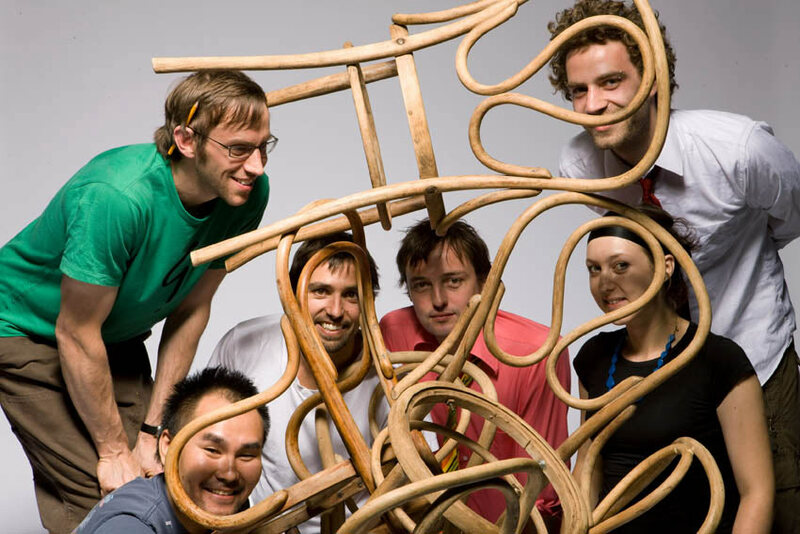 Indeed, the Thonet Project was initiated as a result of a commission to create the third set of replacement seats for some very old Thonet bentwood chairs that had been in use by one family for the last 50 years. 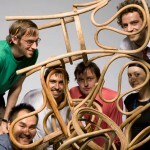 This commission led to recent design graduates Amos Field Reid, Steve Clutton, Jess Corteen, Markus Kayser and Rentaro Nishimura forming a group alongside their lecturer, the designer William Warren, to set out to explore replacement seat proposals for bentwood chairs. The underlying thinking was that with millions of bentwoods in existence there were undoubtedly a great many out of service simply because their seats were missing. Producing pragmatic proposals for third-party replacement seats for these timeless chairs was one outcome, but the confrontation with the voids in these iconic frames also presented other more expressive opportunities. 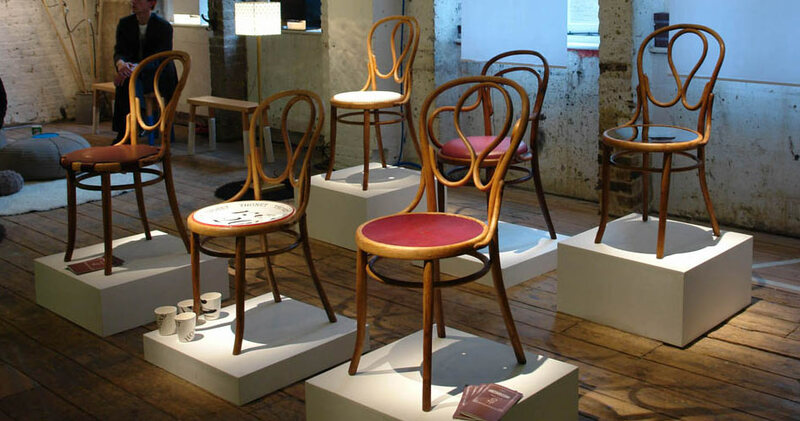 It is hoped that the Thonet Project will inspire owners of old bentwood chairs to get these proto-modern masterpieces out of their attics and basements and back into use. Starting from Marcel Mauss’ premise that relationships are built on gift debts, we have created a seat that contains a gift appropriate to the Viennese coffee culture of the ultimate café chair, the No. 14. The saucer and cup will be separated by the act of giving, but the subtle depression in the seat and the wooden handle of the cup ensure that the two objects remain in constant dialogue, always part of a single whole. Offering the cup (as a gift) is therefore the symbolic equivalent of offering a permanent place at your table. This is a powerful expression of friendship, but it’s also a Trojan horse; the cup will take up residence in the recipient’s home, thus giving you a ‘seat’ at their table. Gifts, debt, relationship, or just sharing coffee – reading Mauss there is love in reciprocity. The no. 14 with its defining motif of the double arch back-rest has been reproduced in chairs of varying sizes and proportions since it’s development in 1859. This elongated version presents a small perch-like seat at the height of a stool, or that of a side table. The star shaped drilled patterns often found in replacement plywood seat of bentwood chairs reminded me of board games such as solitaire and Chinese Checkers (a game originally from Germany). This association of game boards with drilled plywood seats, alongside the height of this no 14’s seat, led to the Checkers chair, with its drilled pattern serving both as game board and decoration. Players sit around the no 14, with the chair taking centre stage as the game commences. When finished, the pieces are stored in the hidden compartment under the board, and the seat becomes ready for sitting on once more. 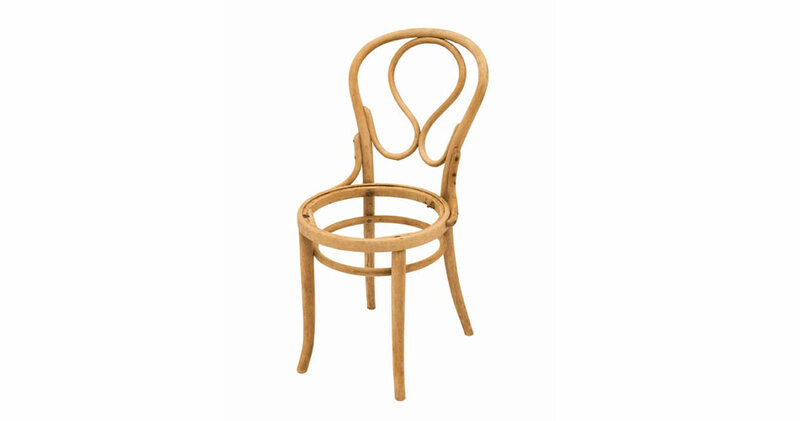 Without their seats these elegant and lightweight bentwoods are more sculpture than chair. In ﬁlling the void where the seat used to be we are putting these everyday sculptures back into use. The challenge was to find a balance between pragmatic restoration and sympathetic innovation. The tensioned Drum seat features an interpretation of the pattern that once adorned many of the Thonet plywood seats, is high on comfort, low in weight and can be ﬁtted without tools. As a simple organic material that lasts and ages well, leather seemed a match for the chairs aged beech limbs, whilst the strapping shares the bolt-it-together pragmatism typical of Thonet’s constructions. This piece was produced in collaboration with leather craftsman Justin Parker. The Mirror seat maximises the sculptural presence of the chair’s bentwood structure whilst simultaneously projecting the contemporary on to this familiar old form. A mirrored seat appeals to me because it seems to disappear and my feeling was that this iconic chair did not require a new aesthetic but rather a continuation of its own. 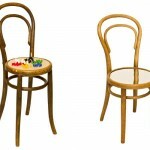 But a hard flat surface is just not very comfy so I chose to make the mirror concave like the original Thonet ply seats. As a one-off this was most efficiently achieved by spinning a seat in brass, plating it with nickel and polishing it up. When not in use the seat becomes a sculptural element of its environment and when sat upon it’s just a nice chair! Paper is one of the most common materials in our lives, and by simply folding it, such thin, lightweight and fragile material can be transformed into a three-dimensional form with structural strength. The design was developed through a series of CAD drawings and physical testing using folded paper models. The sheer number of folds and their arrangement is such that they distribute the load evenly across the structure and make it possible to achieve a seat made from a sheet of paper that supports the weight of a person. The seat became durable enough to withstand domestic daily use by using the synthetic paper which is the material like paper but more durable and water resistant. The series of creases also creates a geometrical pattern of light and shadow that answers the challenge of designing a seat which works not just structurally but aesthetically too. What gift can I offer to this lovely no.14 chair on its 150th birthday? What do you give a chair that has everything: beauty, ingenious manufacture and a long history of satisfied bottoms. I have tried to give this seat a new experience for those it sits. This No. 14 is a child’s seat and the experience I’ve added is light hearted and fun. The noise of furniture is an overlooked aspect of its character. All objects have their own noise; the sound of their material or function. Think of the difference between a glass jug and a plastic one or the closing of well hung door. I believe the sound of things to be of equal importance to the styling they are given. Adding unexpected noises to things can give their personality more richness and improve our interaction with them. We no longer simply use things, we can experience them. I would like to find some replacement seats for our bentback chairs. The seat design is peacock tail moulding. Can you help? Amos, one of the designers who made one of these chairs, had developed a leather seat that wraps around the chair frame like a drum skin. It’s embossed with the same pattern as your original. You can see it in red on the left of image three in this post. If you like I could ask him. Other than that, I don’t know of replacement seats. They’re normally the first parts to go. 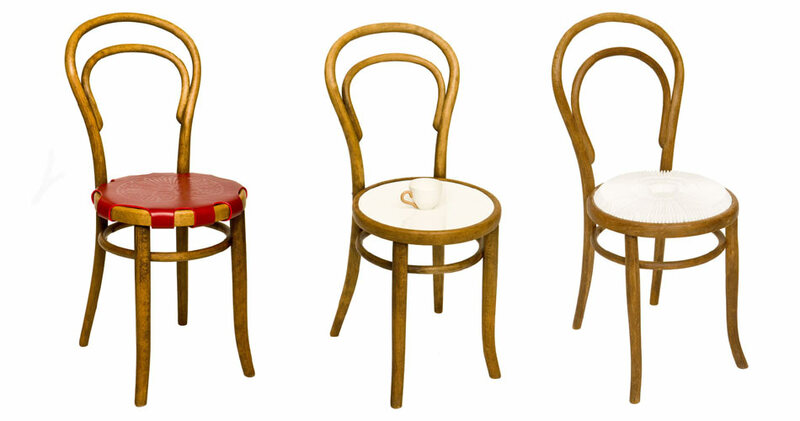 hi wondered if you can help – possibly advise us on how to get provenance and possible value of our thonet chairs. we have 6 old cane seated (beech i think). we bought them 30+ yrs ago 2nd hand and having recently downsized, wish to sell. they have paper label Thonet WIEN + a capital T over G and sort of branded name in wood also underneath.